While there are many durable commercial roofing products on the market, the vast majority of them are for flat roofs. If you have a building with a sloped roof, you must usually choose between residential roofing products like shingles or tile. However, commercial metal roofing can outlive shingles with its superior durability. Lasting 50+ years on average, metal roofs stand up against fire, high winds, hail, water, and sunlight. When you want a roof you can depend on, metal is the best option. Because metal is a naturally reflective material, it provides many green or eco-friendly benefits for your building. Traditional shingle roofs tend to absorb heat, increasing your building temperature and cooling load. Metal, however, reflects the heat from the sun rather than absorbing it. This helps keep your building cooler and reduce your energy bills! Another bonus: metal roofs are recyclable, and are often made from recycled materials. No need to worry about applying roof coatings or replacing damaged shingles. Commercial metal roofing is extremely low maintenance, meaning you can devote more time to your business. If your building is near trees, a seasonal cleaning and inspection can help keep gutters from clogging with leaves and debris. 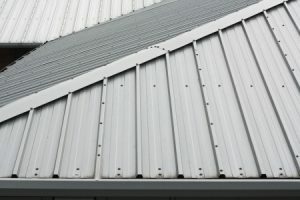 Interested in commercial metal roofing for your business? Call Thompson Roofing & Siding at (573) 789-8367 for commercial metal roofing in Lake Ozark, MO today! Posted in Uncategorized on January 18, 2017 at 5:50 pm by Thompson Roofing & Reconstruction.